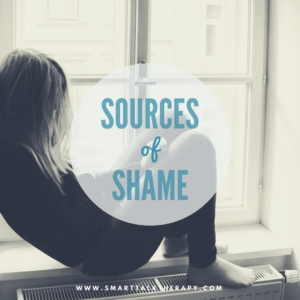 As we continue to explore shame, it's time to turn towards sources of shame. In other words, it's time to figure out where your shame is coming from. This is the first step in learning to heal from shame. There are five sources of shame that a person can have. You can have only one source or all five. It really depends on you and your background. In this blog, we will explore all five sources of shame in order to give you more insight into your own shame. As you read about each source ask yourself "is this me?". For some of them the answer will be yes and for others no. Did you know that children usually start to feel shame as early as 2 years of age. It usually comes along with a child having done something s/he shouldn't have. It can be anything as small as dropping food on the floor, taking something that wasn't his/hers, or drawing on the wall. A parent's reaction is usually to correct that behavior by using a stern voice and disapproving language. The child looks away out of shame and starts to associate those negative behaviors s/he engaged in as shameful. If a parent does not re-connect with the child after scolding him/her, the child starts to feel less than, worthless, and starts to internalize shame as part of his/her identity rather than viewing it as something associated with a specific behavior s/he engaged in. Some families are shame-based families where shame runs for generation to generation. Be it the wife who complains incessantly about the husband not making enough money, the father who whines about the house being a mess, or the parents who highlight the child's C instead of focusing on the As that s/he received. The message is a clear one: You are not good enough and no matter what you try to do, you will not reach the standard that I want you to. Shame can also frequently occur in romantic relationships. The shaming can be mutual where each partner engages in shaming the other or it can be one-sided. Shaming can be anything from negatively commenting on a partner's weight/appearance, to criticizing how intimacy happens, to highlighting a partner's faults in public in front of others. Once again, the person being shamed gets consistent messages of "you are not good enough" or "if you only changed _______, then you would be desirable". We live in an achievement oriented society that is based on conformity and fitting in. The messages that we frequently receive are related to achieving success in our careers, looking a certain way, and acting a certain way in order to be desired. If we don't fit the mold, we are often times shamed. With the emergence of social media, it has become easier and easier to shame others be it by posting meme's related to someone's weight, or negative comments about another person based on his/her sexual orientation, culture, gender, race, etc.... Shame in our culture only continues to intensify each year as different groups start to shift the blame for their shortcomings on others; usually minorities. We, as a society, are moving further and further away from each other while building more and more shame. The final source of shame is related to how we shame ourselves. This usually occurs with automatic thoughts that pop into our minds when we do something wrong. Statements like "I should have known better" or "that's so typical for me" imply once again that you are not worthy and should do better. These automatic thoughts can build over time and can create self-hate and loss of compassion for ourselves. Now that you have learned about the sources of shame it is time to engage in some reflection and identify your sources of shame. By acknowledging your own sources, you are already on your way to creating self-compassion and self-love which will overtime help you combat shame. Below is also an infographic that explains everything that was mentioned above in a shorter format. Feel free to print it out and use it as a reminder as you go through your day. Everything that you have read about in this blog was derived from the book Letting Go of Shame by Ronald Potter-Efron and Patricia Potter-Efron. We have no personal or professional stake in this book; it's just a good book. Since shame has been coming up more and more frequently in our work with clients we decided to spotlight this emotion (and book) this month in order to bring more awareness to the powers of shame. We continue to accept new clients from Illinois (Chicago), California (Los Angeles, San Diego, Orange County, Santa Barbara, San Francisco, Sacramento), and outside of the USA (Canada, Australia, New Zealand, England, Ireland, Scotland, Wales, United Kingdom, Germany, France, Spain, Mexico).